Throughout his adult life, Paul Jones has been a bluesman, known and admired by a number of his fellow Delta musicians but seldom venturing far from home. 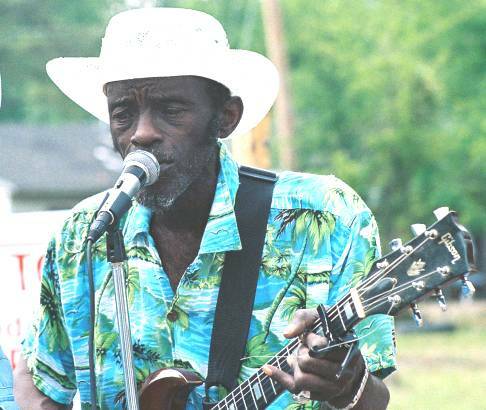 His style is deeply rooted in the rural blues of the delta, but so distinctly original and idiosyncratic that his sound will not easily be mistaken for that of any other artist. Rock-solid bass-string drones, expansively sonic guitar textures, a seasoning of wah-wah riffs, and a voice that can sound vinegary, molasses-like, or simply, urgently passionate, as the song demands – these are some of the qualities that make Paul Jones a unique and formidable talent. “I’m from Flora, Mississippi,” says Paul, “a little town about eighteen miles from Jackson. My daddy was a guitar player years ago, when I was a little boy. When he used to come home from working on the farm, we’d have frolics, and after he played awhile he’d rest his guitar on the floor and I’d get on it. It came natural to me; nobody taught me, I was just born to it. I started in playing, and by the time I was about thirteen, people would come by and want to take me with ’em to play somewhere out in the country. Before my dad died, four of the children had taken up the guitar, including my sister Jo Ann. She stopped, but I didn’t ever stop.” Among Paul’s other siblings was Casey Jones, who now lives in Chicago where he is one of the most in-demand drummers for blues gigs and recording sessions. At 48, Paul is old enough to have heard some of the Delta’s most celebrated blues stylists as a youth, young enough to be a post – B. B. King “modernist” if he’d chosen to go that way. Instead he developed a style that is unabashedly “country” and “in the tradition” but with modern shadings – that wah-wah pedal – and a dexterous manner of subsuming rhythm and lead functions in to a guitar style with the momentum and unpredictability of a runaway steamroller.